A software programmer who wrote a jailbreak application that would replace and improve upon Apple's own iPhone notification system has been hired by Apple, AppleInsider can confirm. Last week, word went out that Peter Hajas had stopped work on his "MobileNotifier" application for jailbroken iPhones. That, along with Twitter posts saying he had gone to work for a "fruit" company in California, led to speculation, from sites like iPhoneinCanada.ca and RedmondPie that Hajas was hired by Apple. AppleInsider was able to independently confirm on Friday that Hajas has indeed landed a job with the iPhone maker. He is said to be working in Apple's iOS Applications & Frameworks division, at the company's corporate headquarters in Cupertino, Calif.
MobileNotifier is an application that was described in the jailbreak-only Cydia application store as "iOS notifications. Done Right." The application had nearly a quarter-million downloads from jailbreak users, and had been upgraded numerous times to reach beta 4. On his own blog, Hajas said he would be taking a break from the software, but added that his departure was "definitely not goodbye." "I can't say why, but it's worth it. Trust me," he wrote. "If you look around hard enough, you'll probably figure it out." Apple's notification system in iOS is often widely criticized as one of the weakest aspect of the mobile operating system. The company is set to show off the next version of its software, iOS 5, at next week's Worldwide Developers Conference. Though it's possible iOS 5 could include a new notification system for iPhones and iPads —and has even been rumored as a new feature —it's unlikely that the recently hired Hajas played a role in the development of any features that might be shown off on Monday. 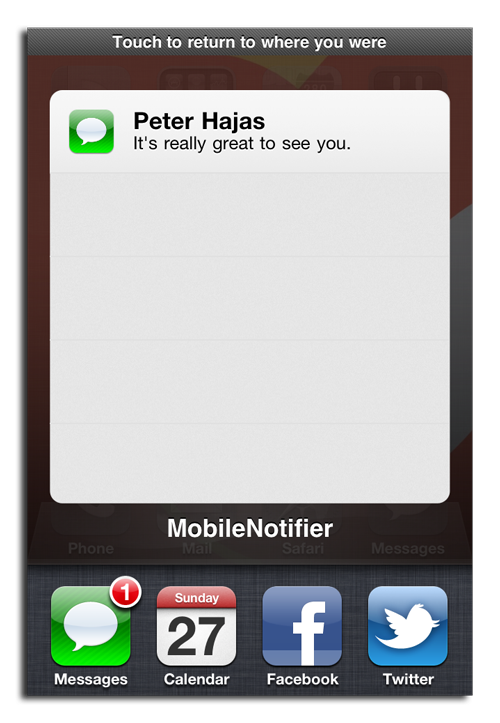 Hajas is another notifications-centric developer who has made headlines after being hired by Apple. Last June, Apple also hired Rich Dellinger, previously the User Interface Design Architect for Palm, where he designed the notification system for Palm's webOS mobile operating system.